These were strong words from the vice president at the annual conference of the powerful pro-Israel lobbying group. The event is supposed to be a bipartisan affair — and House Speaker Nancy Pelosi (D-Calif.) and Senate Minority Leader Charles E. Schumer (D-N.Y.) were among the speakers who lauded the U.S.-Israel relationship. But Pence claimed that eight Democratic candidates for president were “boycotting” the conference. He probably chose the word “boycott” because of a controversial effort known “BDS” — the Boycott, Divestment, Sanctions movement to pressure Israel on its treatment of Palestinians. His remarks also came in the context of the controversy over comments about Israel made by Rep. Ilhan Omar (D-Minn.). But is the word “boycott” appropriate in this instance? MoveOn, the left-leaning advocacy group, on March 20 urged 2020 presidential candidates not to attend the conference. On March 22, MoveOn patted itself on the back and declared: “2020 Candidates Skip AIPAC!” It listed seven candidates, based on tweets and news reports, as not attending the conference: Sen. Bernie Sanders (I-Vt.), Sen. Kamala D. Harris (D-Calif.), Sen. Elizabeth Warren (D-Mass. ), Beto O’Rourke, Julián Castro, Washington Gov. Jay Inslee and South Bend, Ind., Mayor Pete Buttigieg. The Associated Press on March 21 listed five candidates as saying they would not attend: Warren, Sanders, O’Rourke, Harris and Sen. Kirsten Gillibrand (N.Y.). So that gives us eight. There are also at least four others — Sen. Amy Klobuchar (D-Minn.), former Colorado governor John Hickenlooper, former congressman John Delaney of Maryland and Rep. Tulsi Gabbard (D-Hawaii). So that adds up to 12 Democrats running for president who did not attend. But there are some problems with Pence’s calculation. Warren was invited, though not to speak, and chose not to attend, according to spokeswoman Kristen Orthman. Warren also did not meet with any AIPAC representatives when they were in Washington. Orthman did not respond to a question about why Warren declined, so we can assume she’s in the boycott camp. Three others — Harris, Gillibrand and Klobuchar — met with constituents representing AIPAC on Capitol Hill but did not go to the conference itself. Harris even posted on Twitter a picture of herself standing with AIPAC representatives, earning some Twitter hate. Gillibrand has also addressed AIPAC in the past. “Senator Gillibrand was not planning to speak at the policy conference and will not be attending. As she does every year, she will meet separately with her New York constituents,” a spokesman said. Klobuchar “is not planning to attend, but she will be meeting with her constituents,” her spokesperson told Jewish News Service. This seems to fall in a gray area. You can’t really say someone is boycotting the organization if she is meeting with representatives. (Pence said they were “boycotting this conference.”) Still, the conference was being held just a few minutes’ drive from Capitol Hill. Sen. Cory Booker (D-N.J.) met with AIPAC representatives in a side room at the Convention Center, the conference site, though he did not attend the conference, according to an aide. Delaney’s national press secretary, Michael Starr Hopkins, said “we did not boycott AIPAC; we had a scheduling conflict.” He passed along a quote from Delaney: “I am disappointed that a preexisting commitment prevents me from attending AIPAC this year. In no way should my schedule conflict be viewed as me not standing with Israel. … Israel is being unfairly attacked and is subject to an effort to delegitimize its existence with the BDS movement. As President I intend to be a strong supporter of Israel and a strong voice in condemnation of anti-Semitism." A spokeswoman for Buttigieg said he was not invited. But potential independent candidate Howard Schultz also originally was not invited. “He did not speak but visited the conference and met with and talked to people there informally after organizers said he was welcome to drop by,” spokeswoman Erin McPike said. She said Schultz spent four hours at the conference. The Castro, Inslee, Gabbard and Hickenlooper campaigns did not respond to requests for comment. Judging from Gabbard’s recent response to a question about returning donations from people who contributed to AIPAC, it seems dubious that she would contemplate attending. There are additional complicating factors. AIPAC generally does not invite presidential candidates except in election years. We had wanted to check the attendance record of GOP candidates in 2015, but virtually none was announced four years ago when the conference was held. So a comparison cannot be made. The Jewish Telegraphic Agency noted that changes in AIPAC procedures made the conference less attractive to people actively campaigning. Until 2007, AIPAC allowed candidates to hold salons on the convention campus — no fundraising allowed, but an opportunity to meet and greet folks who might want to give once they get away from the convention. In 2007, the buzz at [Barack] Obama’s salon was, well, buzzier than at Hillary Clinton’s, a harbinger of what was to be. The vice president’s office declined to provide an on-the-record comment. AIPAC officials also did not respond to requests for comment. We asked many candidates if they had received pressure not to make an appearance at the conference and did not get a response. How one evaluates the accuracy of Pence’s claim turns in part on definitions. There is only one active Democratic presidential candidate — Booker — who showed up at the convention center. But he only met with constituents, just like three of his colleagues who did so on Capitol Hill. Aides said they were acting as senators, not presidential candidates. Some might argue holding such meetings on Capitol Hill, rather than at the convention center nearby, suggests some distance from the organization. Others might argue it’s a distinction without a difference. We tend to fall in the latter camp, but it’s a close call. Of the other candidates, only two clearly refused to attend the conference or meet with AIPAC representatives. Two cited scheduling conflicts, with one offering a fulsome statement of praise for AIPAC. One said he was not invited — though he could have shown up. And four refused to respond to questions, suggesting the issue was not a high priority for them. Depending on how you do the math, you might get to eight. But it stretches the meaning of “boycott.” Pence would have been on more solid ground if he said: “This is a moment of peril for the pro-Israel forces, and no one should claim they have a scheduling conflict or did not get an invite to avoid being seen here, among friends.” But instead he said something quite different. Pence’s language is not supported by the available facts. 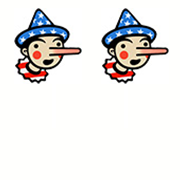 He earns Two Pinocchios. We know this rating will please no one, so feel free to offer your own rating below. “As I stand before you, eight Democrat candidates for president are actually boycotting this very conference."